The Vancouver Condo Buzz » Boutique Richmond TEMPO Apartments for Sale by Amacon > Eco-Friendly, Sustainable, Central, Spacious and Luxurious – Only 237 TEMPO Richmond Condos Available at Affordable Prices! Boutique Richmond TEMPO Apartments for Sale by Amacon > Eco-Friendly, Sustainable, Central, Spacious and Luxurious – Only 237 TEMPO Richmond Condos Available at Affordable Prices! 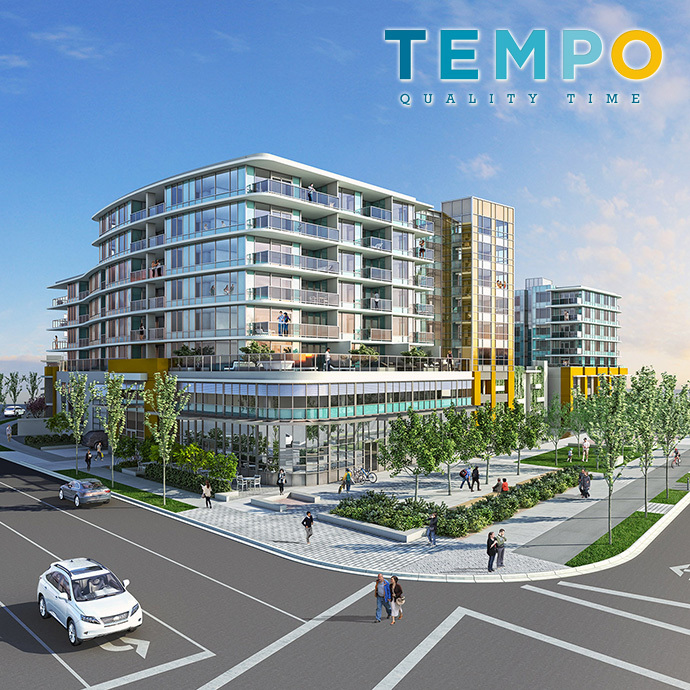 The BUZZ is all about the newest Richmond apartments at Tempo by Amacon developers.This modern mid-rise located at 7720 Alderbridge Way Richmond BC is the latest success story by leading builder Amacon and these gorgeous suites are designed for urbanites and families alike. The preconstruction Richmond Tempo Apartments for sale will feature only 237 boutique residences in an exclusive concrete residential building. Some of the onsite amenities include a fitness centre, yoga/dance studio, pool, hot tub, living green wall, water feature, games room and party room. In addition, the preconstruction Richmond TEMPO condos will also feature garden plots, walking paths, professional landscaping, children’s play area and outdoor sports court. The building will be built to LEED Silver equivalency and there will be central heating AND cooling system with in-suite heat pumps! There are building recycling stations as well as double glazed, low E windows. The new Richmond TEMPO Condos for sale will also feature low VOC finishes and low-emitting materials in addition to water efficient plumbing fixtures which make them truly healthier and eco-sensitive. There’s also a gated parking garage and bike storage lockers. The preconstruction Richmond TEMPO Apartments will also feature secured keyless entry to the main lobby, amenity spaces and parking in addition to an enterphone system and restricted floor access. All homes are backed by the 2/5/10 year New Home Warranty by Travelers, Canada’s leading provider. In addition, the project site is located in a very central area close to transportation, daily necessities, dining, shopping, recreational facilities and top ranked schools. Because of its great location, the marketing suggests that Tempo Richmond condos are ideal for families who value their quality time. We are all connected. The central Richmond locale is also close to No. 3 Road and Lansdowne Centre in addition to the Richmond Oval Village, Minoru Park and the plentiful riverside walking and biking trails that are at your doorstep. All the things you want in life come together right here at the new Amacon Tempo Richmond apartments! Other highlights around the area include Richmond Hospital, Richmond Centre, Richmond Secondary School, London Drugs, Real Canadian Superstore, Cactus Club Café, the Public Market, Price Smart Foods, Kwantlen Polytechnic University, A.R. Macneil Secondary School, Sun Sui Wah Seafood Restaurant, Parker Place, Aberdeen Centre, T&T Supermarket and the SkyTrain Line. View the map above for all the location details and highlights. For more information about the new Richmond Tempo Condos, please register your interest on this page or visit www.amacon.com/tempo/ for all the details. 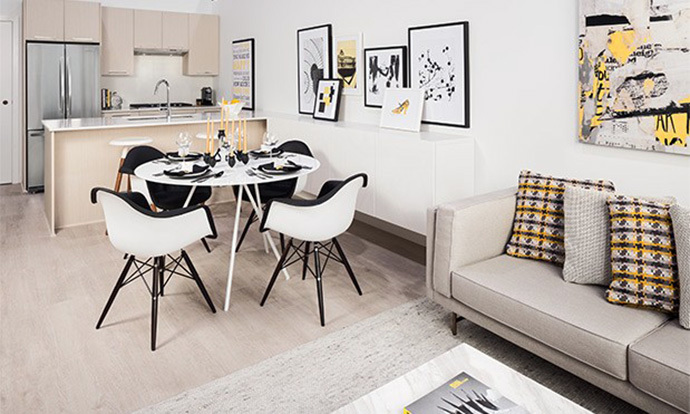 The premier Richmond condos for sale at TEMPO by Amacon features two contemporary interior style schemes called Dusk and Dawn that are designed by Portico Design Group, and award winning firm. In addition, all homes will have front loading, stacked Whirlpool Washer (Energy Star rated) and Dryer in addition to designer carpeting in all dens and bedrooms and porcelain tile work in the laundry closets and bathrooms. The entry, living and kitchens will have premium wide plank laminate floors. 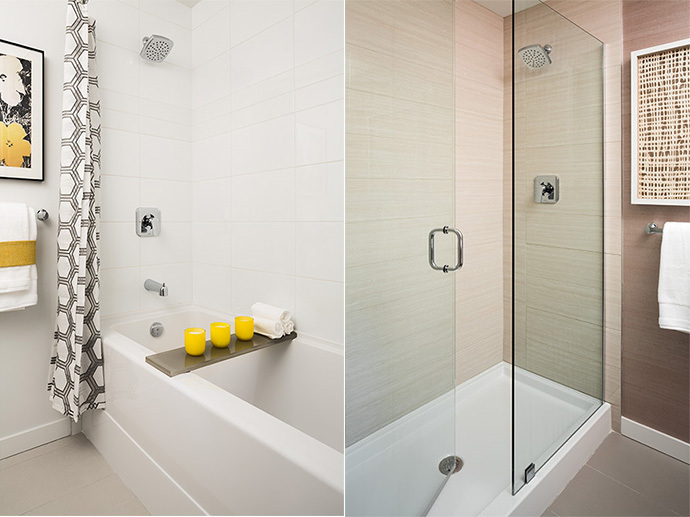 The bathrooms at the new Richmond TEMPO condos by Amacon will feature Toto dual flush low flow toilets, under mounted sinks, custom medicine cabinetry with task lights, Moen faucets and rain fall shower systems in chrome finishing. As well, the new Amacon TEMPO Richmond apartments will feature durable laminate cabinets that have a clean modern profile and modern pulls in chrome finish. There are also polished stone slab counters. The beautiful kitchens will feature a gourmet KitchenAid stainless steel appliance package that includes a thirty inch five burner cooktop (gas), wall mounted convection oven, thirty inch fridge/freezer with French doors and an integrated microwave. There’s also a slide-out, 400 CFM hood fan and multi-cycle dishwasher in addition to low profile recessed pot lighting. The kitchens at the presale Richmond TEMPO by Amacon apartments will also feature sleek stainless steel under mounted sink with double bowls, a Moen dual spray pull down chrome faucet and chrome pulls on the cabinets that are of durable laminate with clean square modern edge profiles. The counters and backsplashes will be polished stone as well. TEMPO – Quality Time – Coming Soon! We all know the kitchen is the heart and soul of every family gathering. Tempo lavished attention on choosing quality finishes and fixtures that fit family life. Stone countertops and full height back splash, gas cooktop, wall-mounted oven and a stainless steel appliance package. Tempo is designed with real life in mind. Family gatherings, movie nights, school bags, soccer cleats – there is room for it all. You’ll find your family has room to grow, thanks to smart interior design choices from floor to ceiling. The Community – We’re all connected. Tempo’s location is central to the best of Richmond. The shopping and dining convenience of Lansdowne Centre and No.3 Road is close at hand. The Richmond Oval, Minoru Park and the riverside trails are at your doorstep. All the things you want in life come together here. Tempo integrates a central courtyard into its design, defining a new way to enjoy your time. This is more than just a green space – it’s all the amenities you want right here at home. There’s something for everyone: a fitness room, a sports court, swimming pool and hot tub, a play area for tots and a dance/yoga studio. Celebrate traditions with family and friends in the party room or spend some quiet time strolling the pathways. There’s even an orchard and private allotments for residents with green thumbs.